On Saturday I headed to London with Vanessa (The Other VW) for the long awaited London iMats (International Makeup Artist Trade Show) Ever since we planned to go together, I've been overly excited and patiently awaiting June 28th to roll around. I didn't have any products or brands in mind, but I gave myself a budget and let myself do some rare spur of the moment beauty shopping. We arrived really early, browsing the different stands and making quite a few purchases. There were tons of products and brands which really caught my eye, but a lot of the stands were professional special effects makeup (which I wouldn't have a clue how to use), and others were brands I didn't know enough about to invest big amounts of money on. I'm really happy with my beauty buys, and excited to use them all! My favourite beauty buy has to be a beautiful Ellis Faas Hot Lips in L404, a truly stunning flamingo pink that I am just head over heels with. Seriously, it just has that extra something-something that no other pink in my collection has, and as soon as I swatched it, I knew I would be parting with my cash! Ellis Faas is a brand I have browsed in Selfridges many times before, but it's a brand I'm relatively new to and so I've never plucked up the courage to buy. Hot Lips is an insanely creamy liquid lipstick with just the right consistency that it feels weightless, whilst providing a true opaque colour with a stunning matte finish. Could this be the start to a new brand love? As soon as I saw the Inglot stand, I was over there like a woman on a mission! I have been so eager to try Inglot eyeshadows ever since I heard of them, and there's an Inglot website here in the UK, but the product range is seriously small and it's not worth making an order. I wanted to get my hands on Inglot in person, and I had the magnetic board and four shadows ready to go within minutes. I know I should try more shades when it comes to my shadow picks, but I am just too smitten with deep berries, warmer highlights and bronze and coppers right now. I opted for a palette with the four shadows I'd picked, and I really love the design. 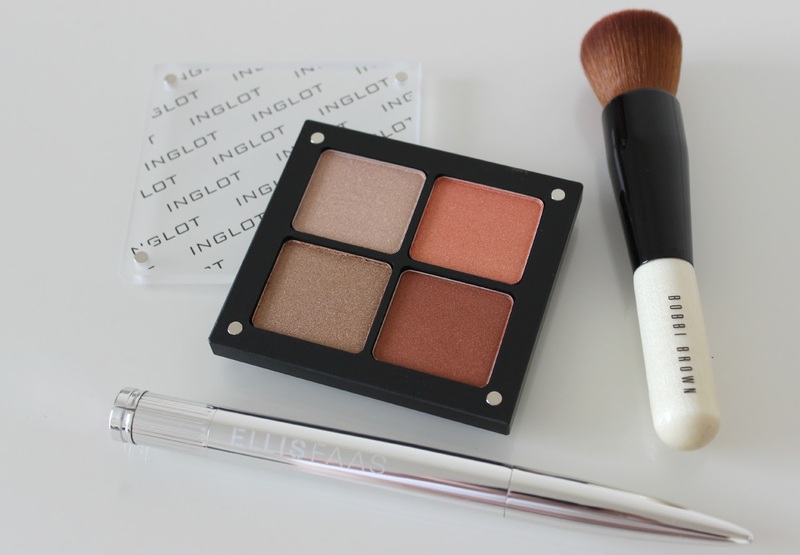 Very sturdy plastic and perspex with the Inglot design, with a metallic base and lid. None of the shades have names, but I picked three with the same shimmer finish and one satin finish. There's a lovely pale golden yellow with warm rose gold undertones, a lovely pale bronze, a stunning sunset with tones of peach, orange and gold, and a beautiful bright yet warm cranberry. I'll be doing a full review of these beauties very soon. I've been wanting to add some more brushes to my stash (despite owning more than I need, ahem brush addiction) and tons of stands were selling brushes very similar to the much loved Real Techniques range. I spotted Royal & Langnickel which was selling sets of six brushes with a travel case, for just £10 a set. There were tons of bright metallic colours to choose from, and the deep violet handled and tipped brushes caught my eye! Slightly shorter handled than most brushes in my stash, these are soft as silk. I'm yet to use them, but I can't wait to see how they fair! 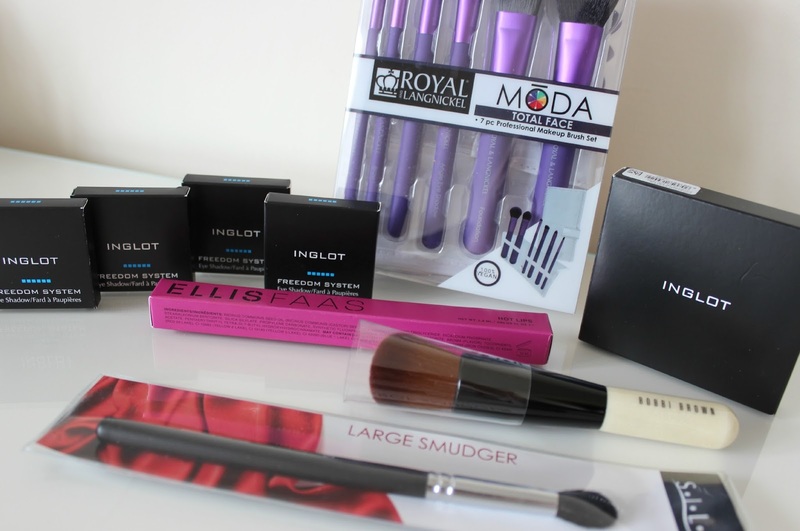 The MODA Total Face 7pc Brush Set included a white travel case alongside powder, foundation, smokey eye, angel eyeshadow, lip and brow brushes. I also picked up a Silk Large Smudger from Royal & Langnickel, as I've been after a few more for in between brush-washing. The final purchase I made is a product I have lusted after ever since it's release, and with the fab discount on the day, I couldn't resist. The Bobbi Brown Full Coverage Face Brush is a super dense, rounded brush with ultra-soft bristles that's described as perfect for creating a flawless, full-coverage look. A brush which can be used with dry or wet products, such as powders and bases. Far too excited to get using this! Did you go to iMats this weekend? I really enjoyed it, although it wasn't quite what I expected. I think in my head I imagined it would be much bigger, with more stands and brands, but I loved looking around, being introduced to new brands. The best bit for me was definitely the demonstrations, body art and special effects makeup. Every single one was absolutely mind-blowing, and if I go next year, it'll be to spend more time watching the different brand shows and stay longer to see the end results of all the demos! I would love to try the Inglot eyeshadows! Very envious of your purchases! Ah IMATS sounds amazing, a few friends have been and Instagram is full of great pics. The eyeshadows look fab, would love to see swatches, I've never used them before either. Ohh such a nice haul!!! I absolutely love Inglot eyeshadows!!! I'd really like to go to IMATS next year! so many goodies! Ooh, you got some lovely pieces! That Inglot palette especially is so gorgeous. 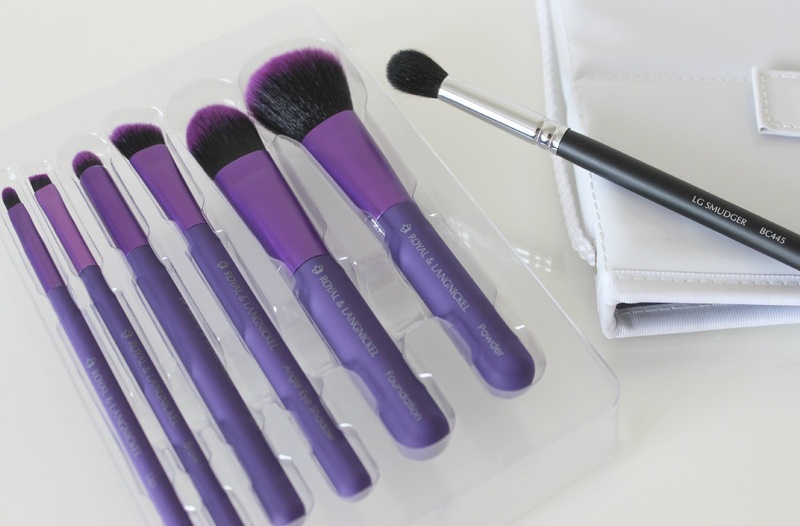 All of these look lovely, and the purple brushes look wonderful. Love your blog the name is brilliant have just followed you on bloglovin , cant wait to read more! I adore Inglot. They have quickly become one of my favourite brands. And the prices on the last day were crazy amazing, it was like a riot when I finally made my way there. The Inglot eyeshadows look gorgeous! I would love to go to IMATs one day, that purple brush set looks so pretty!